QuadraNet NEO Management Portal NEO is an all-in-one customer management portal where you can manage every aspect of your relationship with QuadraNet. 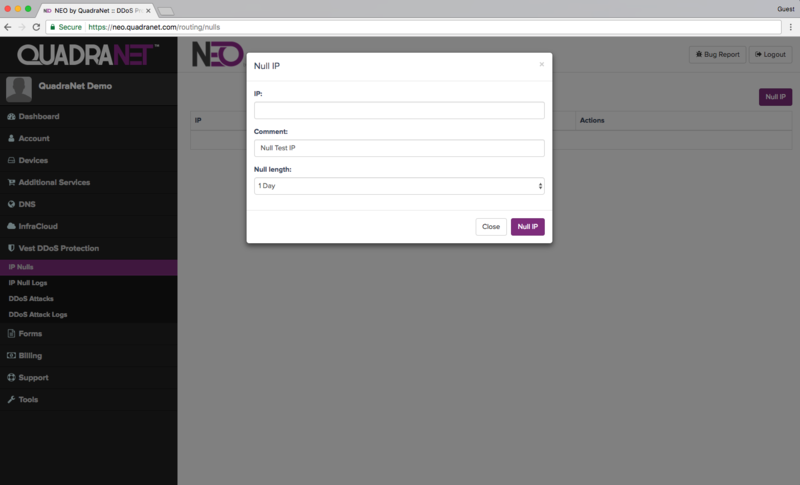 Manage Your Account Within the NEO client portal, you will be able to manage various aspects of your account in one portal, including the ability to create sub-accounts/authorized users for your staff. Dedicated Servers, Colocation and InfraCloud Manage all of your services within one portal: Dedicated Servers, Colocation, and InfraCloud! 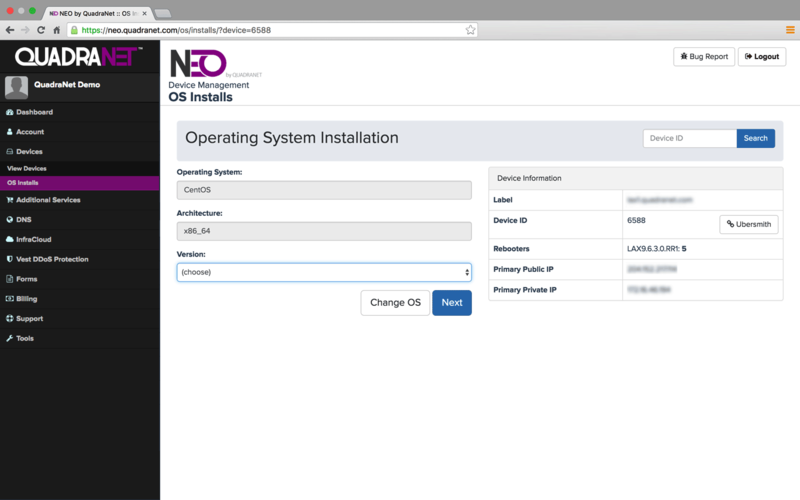 Instantly Activate/Deactivate Software Licenses Instantly activate/deactivate cPanel, KernelCare, and CloudLinux licenses within the NEO client portal! 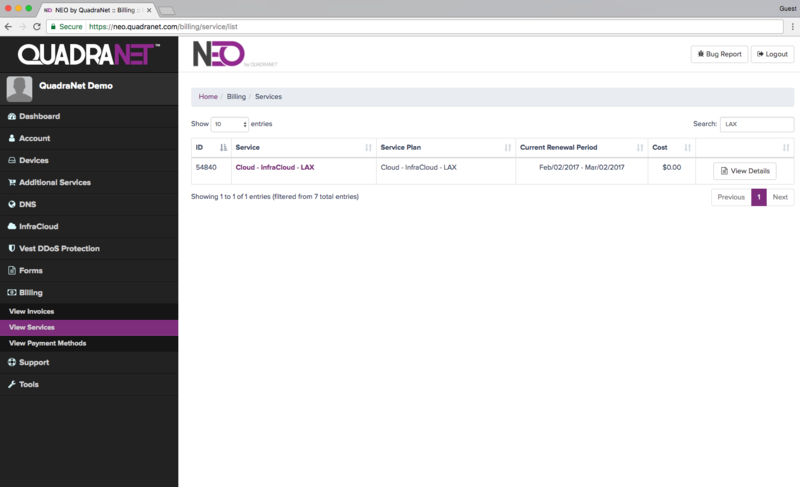 Manage DNS and DDoS Protection Set reverse DNS records and view DDoS attack history within our proprietary NEO portal. 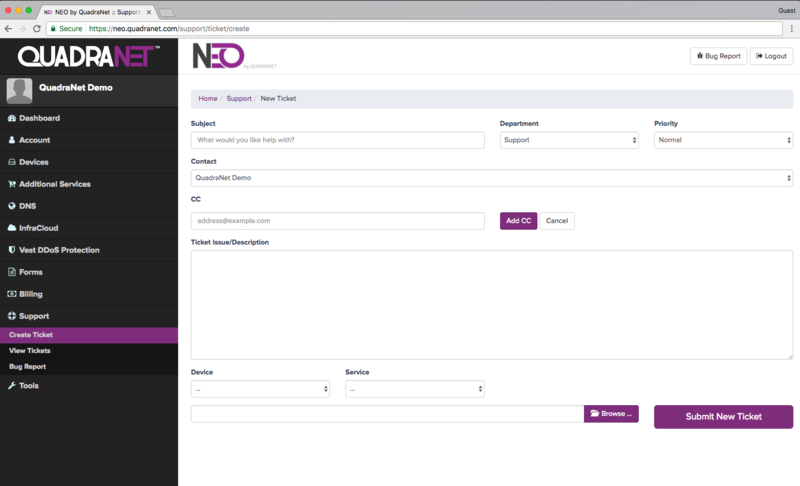 Billing and Support Manage invoices, and also interact with our 24x7 support team within the NEO ticketing system. We keep an eye on your servers With IMP, we keep an eye on every aspect of your server to ensure it's running healthy at all times. We display the data/graphs to you for your review as well. High-Load Alerts High server loads are a thing of the past, with IMP. If your server load is higher than normal, our support staff will immediately be notified to review and take the necessary course of action to resolve. All Services Monitored IMP monitors individual services such as mysqld, httpd, etc - if a service is ever down, it will immediately notify our 24x7 support staff to review, all without any intervention required on your end. 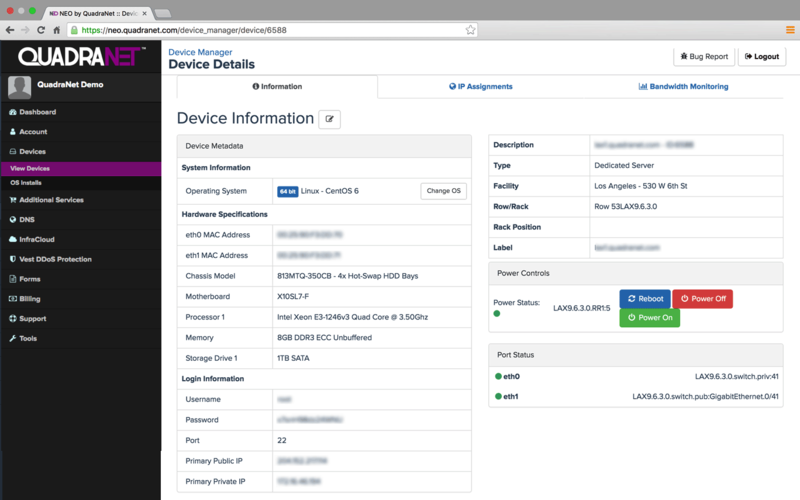 Disk Health IMP monitors your server's disk health at all times. Monitoring Logs Proactive Server Management with IMP also logs activities that are happening within your server, and if an issue required one of our staff to intervene and manually review, it will notify you of what we have done to resolve the issue, all without any communication or action required from your end! 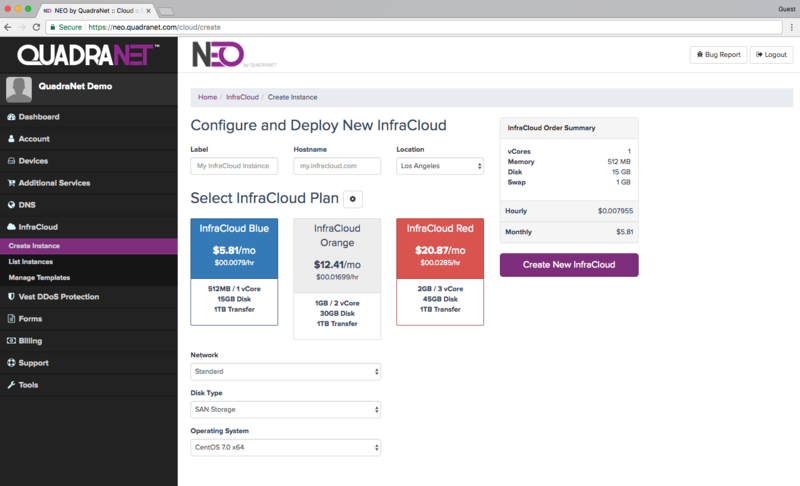 Configure and Deploy New InfraCloud Instances Within our NEO client portal, you can deploy and customize InfraCloud instances on the fly, in different datacenter locations! Monitor Apache, MySQL, SSH and Other Services With IMP and Proactive Server Management, you can set up your server's individual processes to be monitored such as Apache, MySQL and SSH. If these services are ever found to be offline, our staff will immediately intervene and remedy the issue. All without a single interaction required from your end. Talk about proactive! Submit and Manage Support Tickets Within our NEO client portal's ticketing system, you can submit cases for our 24x7 support team, and review the case at any time within our secure portal. QuadraNet clients have the ability to manage every aspect of their account and services through the NEO control panel. 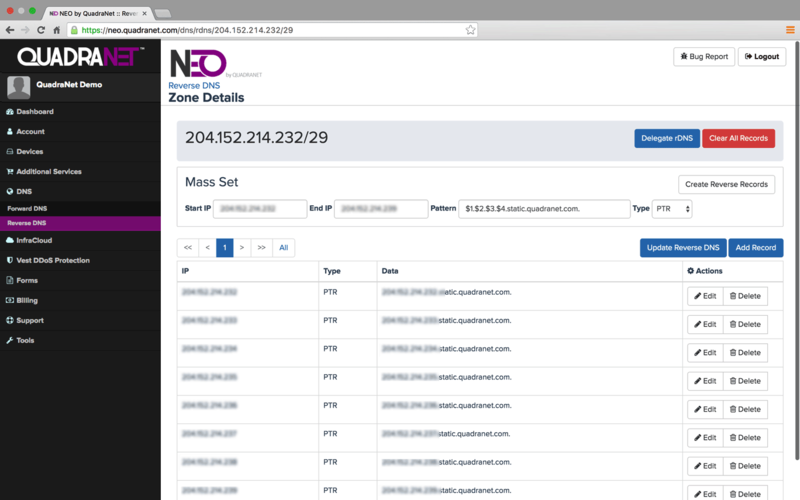 NEO is QuadraNet's proprietary customer management system built in-house to give customers total control of their relationship with QuadraNet. From adding a new server to updating your billing info everything and anything can be managed through NEO. Take a look at some of the features that NEO gives clients complete control over.